Around this time of year, I always crave Mexican food. Let me rephrase that… being from Texas I crave it year round, but the craving is especially bad right after the holidays. Heck, I’ll eat it three times a day if I can. I think it’s from turkey and dressing overload, you know? In a medium non-stick pan, cook the ground beef until no longer pink, 8 to 10 minutes. While meat is cooking, make the pico de gallo by mixing together the tomatoes, onion, jalapeños, cilantro and garlic in a medium bowl and set aside. Place can of enchilada sauce in a medium bowl. Dip one tortilla in the sauce to coat each side. Lay tortilla on a platter, top with 1/4 cup of meat, then 1/4 cup of pico de gallo and finally 1/4 cup of shredded cheese. Repeat process two more times for a stack of 3 enchiladas. Heat platter in microwave for 20-30 seconds until cheese is melted. 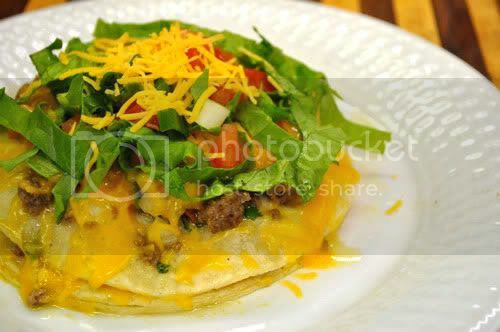 Top with shredded lettuce, sliced green onions, any extra tomatoes and finally, cheese. Serve hot. I LOVE stacked enchiladas! 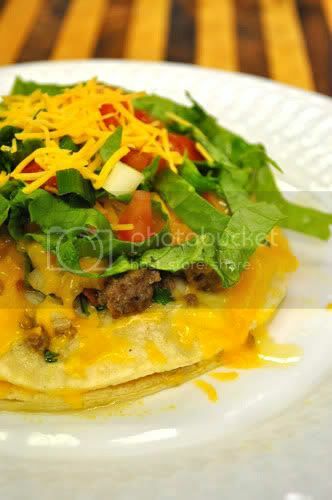 We just had taco diner the other night- so good! (and Jim Knox pulled in the parking spot next to us- haha!). I always make my great-grandmother’s stacked enchiladas right after Christmas- a much needed break from all the holiday food! In fact, I just made them the other night and I’m reposting them because the old pictures are a nightmare! I’ve never had stacked enchiladas! I want some now! Or, I’ll probably wait till the weekend to make them. oh my!! this looks soo soo delish!! Taco Diner?? What am I missing? Are there any in Tarrant County or do I have to drive to Dallas? Unbelievably, I’ve never had these stacks. Will try them this weekend. I totally relate about the Mexican food cravings. I tried to hold back… I tried not to make these tonight – but I couldn’t… I needed them!